Every computer connected to the Internet is provided with a domain name and an IP address. When a visitor requests a web page from within the Prism Electronics website, our servers automatically identify and log the HTTP request that is made. By analysing visitation patterns, referring URLs and search engine terms, we can strategically enhance our exposure across the Internet. This website does issue cookies (these are small files of information which websites use to identify its users); however, these do not contain personal information. Prism Electronics does not share this data with third parties. You can disable cookies by altering the settings of your browser and the website will still function. Please be aware that some of our services may not function correctly if your browser does not accept cookies. Google Analytics cookies are used to collect information about how visitors use our site. We use the information to compile reports and to help us improve the site. The cookies collect information in an anonymous form, including the number of visitors to the site, where visitors have come to the site from and the pages they visited. Click here for an overview of privacy at Google. To opt out of being tracked by Google Analytics across all websites visit Google’s Analytics opt-out page. We may also request your email address or mailing address for the purposes of providing information, conducting surveys or to add you to our mailing list, or by your request to have someone contact you for additional information. Whenever we request the identity of a visitor, we will clearly indicate the purpose of the inquiry before the information is requested. We enforce a strict Anti-spam policy that means we do not intend to sell, rent, or otherwise give your e-mail address to a third-party for their use without your consent. Prism Electronics will only disclose your personal information or any of its log file information when required by law or in the good-faith belief that such actions are necessary. 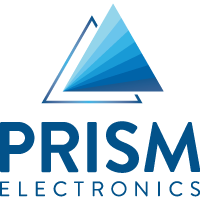 In addition, Prism Electronics will not send you emails that you have not agreed to receive. If you are a member of our mailing list, you may be contacted with announcements, blog posts, resources additions, and new publications or services. Prism Electronics uses all reasonable precautions to keep the information disclosed to us secure. Prism Electronics reserves the right to transfer information in connection with the sale of all or part of Prism Electronics capital stock or assets to any third party. Should you still have any concerns about our use of your personal information, please feel free to contact Prism Electronics.